Back in 1998, I came down with a bout of pneumonia. I was laid up in bed with nothing to do but to watch films. The medication, fever, and cough all contributed to a very strange first viewing of Darren Aronofsky’s debut feature, Pi. By the end of that film, I wasn’t sure if I had some sort of sickness-induced fevered dream or if what I had watched actually happened. After beginning to recover, I watched the film again. And again. And again. Pi was a bit of a Rubik’s Cube for me. It was a tiny-budgeted movie with huge ideas. It struck a chord. I couldn’t shake the stark nightmarish images and virtuoso direction. Pi was and is still one of the very best paranoia thrillers. It belongs in the same conversation as The Manchurian Candidate, Three Days of the Condor, The Conversation, and Blow Out. By the release of Requiem for a Dream I, along with many others, was already an Aronofsky-disciple. With the release of his second film, we were vindicated. Requiem for a Dream is the ultimate anti-drug film. Aronofsky created a potent film that resonates today as it did 20 years ago. Harrowing doesn’t begin to describe the movie. Part of what made Aronofsky and the film so revered was the control that the then 30-year-old director had of the medium. Requiem was leaps and bounds more accomplished than Pi. The film is more than the ultimate ‘feel-bad’ movie. It has a grace and heart in its quiet moments. Those qualities perfectly distilled by Ellen Burstyn’s Oscar Nominated performance. Even now, the film towers over most of what was released in the early 2000’s. The Fountain, Aronofsky’s third film was released in November of 2006. It was received by a small but vocal fan base. Many mainstream critics reviewed it with a shrug. They, along with others, never bothered to notice that Aronofsky continued his uncompromising career. I saw the film opening night in a theater populated by twenty people. I wanted to run out of the theater and scream at the people entering Scary Movie 4 or whatever they were watching and tell them they should be seeing The Fountain. None of that matter once the film started. A love story told in three different time periods. A film about death and life and what it means to let go and accept inevitable fate. Death is the road to awe… I left the theater stunned. I couldn’t form words. Over the ensuing decade plus, I have talked and recommended the film to every person I know. It’s become the litmus test for film geeks that come into my life. Where do you fall when you watch The Fountain? Are you confused by it? There are few films as beautifully delicate and direct as The Fountain. The fact it was made is a minor miracle. In 2002, Aronofsky was given the green light on an $80 million version of The Fountain Starring Brad Pitt and Cate Blanchett (in the roles that would inevitably go to Hugh Jackman and Rachel Weisz). It was a huge metaphysical science fiction love story. Epic battles in the Mayan Jungles. A Doctor racing against time, trying to find the cure for cancer. Space vistas as a lone traveler and his ship move quickly to a dying star. Warner Brothers had given the 33-year-old director keys to the kingdom. Two Oscar nominees. Huge budget. Epic story. As sets were being built and casting was completed, Warner Brothers pulled the plug. Aronofsky has been graceful and gentlemanly about the subject, never assessing any blame for the implosion other than the oft-used “creative differences.” When the word got out that The Fountain had fallen apart, the film community collectively sighed at the loss of what could have been a huge milestone in big-budget science fiction. This would normally be the end of the story, another big-budget science fiction film in the vein of Jodorowsky’s Dune shut down before it began. The death of that iteration of The Fountain wasn’t the end. Rumors kept surfacing that Aronofsky was going to reconfigure the project for asmaller budget. Warner Brothers still wanted in. To his credit, Aronofsky worked for years and years on a pared-down version of the story. The essence of the bigger budgeted version would still be in the new version. Aronofsky and co-writer Ari Handler streamlined everything and removed the pomp and circumstance (a huge epic battle at the beginning of the film that was Conquistadors vs. Mayans on the level of a The Lord of the Rings battle sequence). The biggest regret from the entire folding of the ’02 production is that Pitt has yet to work with Aronofsky. They came close again with a version of 2010’s The Fighter that version had Matt Damon and Pitt starring as the brothers who were eventually played by Mark Wahlberg and Christian Bale, respectively. Everything that the 2006 version of The Fountain; the beauty and the story was all informed from that 2002 production folding. The film is stronger than it would have been in 2002. The paring down of budget, consequentially the script, lead to a more intimate and focused story. 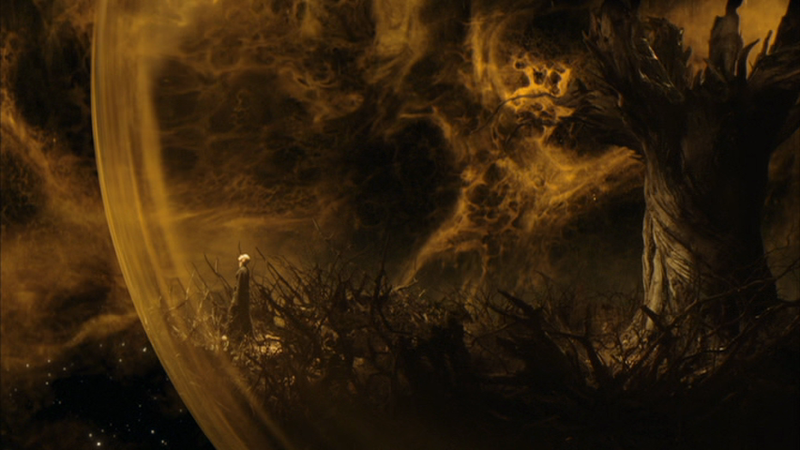 Everything feels handcrafted like Aronofsky made sure to put his fingerprint on every frame. The film is put together with love and care by not only Aronofsky but the cast and crew. Of the seven films that Aronofsky’s made, The Fountain is the one that he’s cared most about. The Past/The Book: The Conquistador Tomas Creo and his quest are written by Izzy in her novel. The Present: Tommy Creo is researching cures for Cancer. Izzy Creo, his wife, has cancer. The Future: Tom Creo travels with specific cargo towards a dying sun. Though two of the three storylines are told against huge backdrops (the Mayan Jungles and the Vastness of space), there’s a beautiful intimacy with which The Fountain plays. The film focuses on close-ups of actors rather than landscapes or vistas. The camera is framed so that the actors look directly into the lens. This technique was employed by the late Jonathan Demme to great effect in many of his films, most notably in The Silence of the Lambs and Philadelphia. This particular technique could be jarring in the hands of a lesser director. In the hands of Aronofsky and Cinematographer Matthew Libatique, the camera’s subjective point of view draws you into the story. It gives the artifice that you are with the characters on this journey. Libatique lights the film in a golden hue, which is opposed to the conventions of the science fiction genre. Often times science fiction stories are told in that drab blue-green tones that has haunted cinemas since The Matrix. The warm and lush feeling of the images sets it far away from typical genre fare. These type of visual flourishes push the film beyond the “what’s cool” factor lesser films resort to. Everything has meaning and purpose within the visuals. Aronofsky’s style and camera veers from formality to esoteric with purpose. Many employ these techniques but none remember that color, camera movement, framing are all to evoke an emotional response. Libatique and Aronofsky design their films with this in mind. Taking great care and understanding never violating their own rules set in the film. It is what separates Aronofsky’s films from others, more financially successful. The Fountain asks you to work, it challenges you as an audience member. By design, it is not your average filmgoing experience. It asks you to pay attention. It asks you to think and feel like a human. Many movies go for the animal instinct in its audience. Make you scared. Make you angry. Make you happy. Make you sad. Or make you think. Not many of those emotions at the same time. Films usually only work on one basic level and then moves to the next. Rarely do they explore multiple planes of thought and emotion at the same time. Aronofsky wants to engage an audience the way we engage in real life. He wants to make the audience think at the same time he wants them to cry. He makes us fearful for a character as we swoon within the same moment. There is a scene midway through the film. A beautiful transition from the future to the present. A piece of a tree turns into the lush flesh of a woman’s thigh. Tommy is giving a bath to Izzy. She finds that Tommy is without his ring. She playfully teases him about not wearing it. He takes the teasing to heart and begins to leave. Izzy stops him and tells him something that sets off a chain of events/actions that take them from dread to desire to happiness to consummation. To see both actors play the complexities of the scene is amazing. It is a perfect combination of conflicting emotions. The reality in that scene and how it plays out is something that’s specifically Aronofsky. He injects hyperreality in films that are anything but. Many have dubbed The Fountain as simply Science Fiction. They do so in a derogatory manner, as though the genre had something lacking and is only meant to be discussed among teenage boys. Many supposedly important films do not have even a small fraction of the grace The Fountain achieves in this single scene. The film is a dance between two actors with six performances between them, no small feat of acting within any film. Hugh Jackman and Rachel Weisz could not have been more perfectly suited for the roles of Tomas/Tommy/Tom and Isabella/Izzy/Isabelle. Each role has challenges emotionally and physically. Jackman is called to be a powerful conquistador in the Past/Book sections and emaciated like he’s lived for thousands of years in the Future sections. The same of Weitz who’s to be a Queen in the Past/Book Section but in the Present, dying of cancer. It gives them the full spectrum to play and takes each to places they’ve never been to and probably will never go again. Isabella/Izzy/Isabelle is played beautifully by Rachel Weisz. Weisz imbues her characters with a sense of life and love that makes you believe how Tomas/Tommy/Tom reacts to her in each of the time periods. The word that comes to mind is luminous. With less screen time that Jackman, Weisz manages to loom large over the film. Her presence haunts the film even in sections she’s not in. The film echoes with her warmth and glow. Weisz had won her Oscar for a similar type of role in 2005’s The Constant Gardener effectively playing someone’s memory. There’s a trick done in that film that did not work for me and felt cloying. This is the more effective of the two performances. There’s less affectation and more directness as Izzy. She’s the heart and soul of the film. Everything that Tomas/Tommy/Tom does in the film is because/for her, we as an audience have to believe that he would go as far as he does for her. We do and it’s because of how open her performance is. There’s no actor tricks or ticks. The hardest skill for an actor is to be still and play moments with their eyes. It’s a skill that Weisz has mastered; her huge eyes and open round face allow for some of the most beautifully composed close-ups in the film. Everything that needs to be said is behind Weisz’s eyes. The journey of Izzy is the most important part of the film. The acceptance that she only has so much time left and wanting to just spend it with her loved ones is so heartbreaking. Those moments where she’s pleading with Tommy to stay with her, knowing full well the time they have together is coming to an end, are some of the most harrowing scenes in the film. The helplessness that Weisz brings to those moments, that Tommy isn’t able to see what’s right in front of him, is graceful and never feels like a trick. It’s a performance that that’s could come off gimmicky. Instead, it’s Weisz’s best performance to date. Hugh Jackman has had few roles that test his range and show that he’s more than Wolverine. Here as Tomas/Tommy/Tom, he’s able to flex his muscles as a performer. Most would not be able to play a Conquistador, a research Oncologist and an Astronaut in three different movies, but as written he’s asked to play all three within the film. The beauty of his performance is that each of the roles inform on the other. There’s never a moment where Jackman isn’t fully invested in the part(s) he’s playing. Aronofsky is just as much a part of the performance as Jackman is. The film is told in a very specific manner that allows Aronofsky to exert a certain amount of control over Jackman’s performance and how it’s perceived. After a certain scene Jackman becomes a raw nerve. Everything is on display. The grief that Jackman takes Tommy to is so real that it’s almost too much to watch. As the pieces begin to come together by the end of the film, certain specifics of the films come together and Jackman never stops or winks at the audience. Tommy’s loss is laid bare as is his guilt, his anger, his defiance of death and his unwillingness to let go and accept he is going to die and by default his wife’s fate. That complete faith in everything that he’s doing, allowed Jackman to get to a bare emotional place that shows what grief is like for a man, when no one is around, when no one is there to see you. So, much of life is the perceived notion that we are all strong and don’t cry. Jackman lets us behind the curtain, he shows what happens to a man who looses everything he loved in life. It’s a powerful performance. The film is ultimately about accepting that you will die in order for you to be able to truly live. The moment that Tommy says, “I am going to die” as he looks at Izzy is his final moment of acceptance. The final moment of resignation that will allow Tommy to be at peace. He isn’t at peace the entire film when he tries to fight the inevitable and it’s only with that understanding that he cannot stop what comes to us all, is he finally able to truly move forward. There is a specific scene that is played multiple times in the film; Izzy comes to see Tommy at work and asked him to come with her to see the first snow, he recants each time, telling her he has too much to do. It’s played multiple times like those moments we have that we wish we could have changed. It isn’t until the final time this scene is played and Tommy allows himself to chase her and go after life that he begins to come to peace with himself. The Fountain ultimately asks what is important in life, chasing goals or being with people we love? No one lives forever. Everyone dies. If you do continue to chase those goals the people you love may not be there. The life you live, you must always consider that death plays as much a part of it as life does. The Fountain knows this better than any film. The Fountain is available on Blu-Ray and VOD. ¹ Originally appeared on FilmDispenser.com (which Adam has put a new coat of paint on). I do not think that the future isn’t the future at all. I think that the future is the way that Tommy finishes the book. It’s his way of dealing with the grief and how he lets go of Izzy. He folds himself and his present life into the story and creates the space scenes as his version of grieving and letting go. It’s all a parable and not to be taken literally. The ghosts that haunt Tom Creo in the future in his ship with his cargo are Tommy’s (from the present) guilt and sadness over the loss of his wife. The book that Izzy writes is about the Conquistador Tomas Creo searching for The Tree of Life. The key is that she’s left the last chapter blank for Tommy to finish. It’s her gift to him, though he doesn’t realize it yet. She gives him the closure.